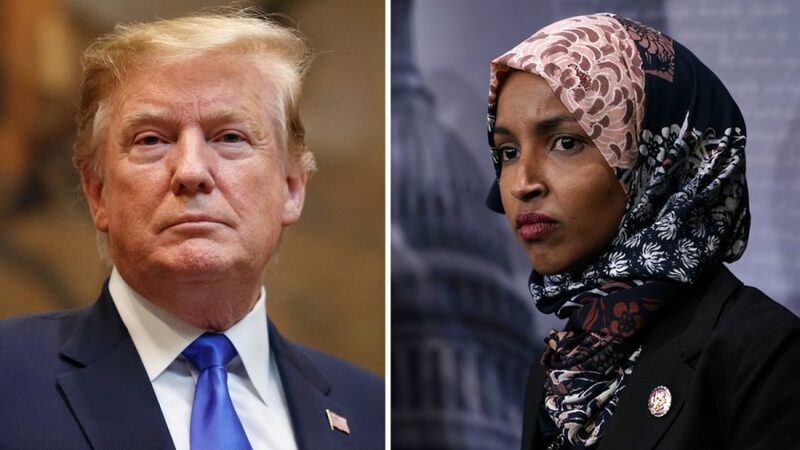 President Donald Trump has responded to Rep. Ilhan Omar (D-Minn.) description of the Sept. 11, 2011, terror attacks on social media on April 12. The president’s post was in response to Omar’s description of the attacks, who called it “some people did something.” Her comments were made as part of a speech last month at a Council on American-Islamic Relations (CAIR) fundraiser, during which she said the radical Muslim group was founded after the terror attacks. CAIR describes itself as a “nonprofit, grass-roots membership organization … established to promote a positive image of Islam and Muslims in America,” but allegedly has ties to several extremist Islamic groups such as the Muslim Brotherhood. In 2007, CAIR was named as an unindicted co-conspirator in funding the Palestinian terrorist organization Hamas, as revealed in the case against Holy Land Foundation for Relief and Development. The United Arab Emirates designated CAIR a terrorist organization in 2014. The Democratic congresswoman came under fire for trivializing the attacks that killed nearly 3,000 American citizens. Many commentators and political figures immediately condemned her comments. “Ilhan Omar isn’t just anti-Semitic–she’s anti-American. Nearly 3,000 Americans lost their lives to Islamic terrorists on 9/11, yet Omar diminishes it as: “Some people did something.” Democrat leaders need to condemn her brazen display of disrespect,” McDaniel wrote on Twitter. Paul Sacca, an associate editor of BroBible, also called out the freshman Democrat for minimizing the terror attacks. “‘Some people did something’ sounds like a bake sale, but it does not really sound like a terrorist attack that killed 3,000 people and altered the NYC skyline forever…,” Sacca wrote. Moreover, Rep. Max Rose (D-N.Y.) called his colleague’s comments “insensitive” and “offensive” during an interview with The Daily Briefing. “Let’s be very clear about this. This is insensitive and offensive. On 9/11, radical terrorists attacked us. New York City lost thousands of people. My district Staten Island and South Brooklyn lost hundreds of cops, firemen, first responders more than any other district in America. There’s a lot of pain right now,” Rose said during the interview. Her comments also prompted the New York Post to rebuke the congresswoman on the front page of its April 11 paper. “I’m not going to quote the NY Post’s horrifying, hateful cover. Here’s 1 fact: @IlhanMN is a cosponsor of the 9/11 Victim Compensation Fund. She‘s done more for 9/11 families than the GOP who won’t even support health care for 1st responders- yet are happy to weaponize her faith,” Ocasio-Cortez wrote on April 11. “In 2018, right-wing extremists were behind almost ALL US domestic terrorist killings. Why don’t you go do something about that?” she added. She also claimed she was receiving death threats over her comments, asking fellow congress members to condemn the threats. “This is dangerous incitement, given the death threats I face. I hope leaders of both parties will join me in condemning it,” she wrote on April 10. Omar has come under fire for a number of remarks and actions she had previously made, including making anti-Semitic tropes.